Happy Birthday Miss Millie! I cant believe she is already 4. I love the blanket too, and Tobie looks rather cute too. What a great birthday surprise. I hope she had a fabulous day. 4 is such a great age to be! Hi Jodie, you have such quite girls and a gorgeous baby to boot! Hope you still like the jug I sent you. Any pics from where it sits? Happy new year to you and your family and all the best! wanted to say lovely girls! I do not know about quiet though! Yay! Happy Birthday Millie you gorgeous little girl! You are growing up so fast and getting cuter by the day! 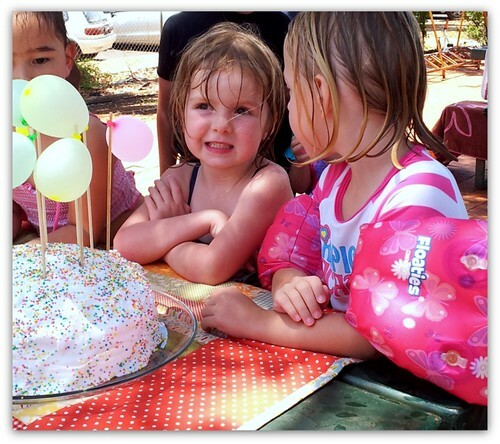 Beautiful Jodie...love that birthday cake! Congratulations to your family on the birth of baby Tobie. Hope the hot weather isn't fussing him too much. Happy birthday to your Millie too. I like being a tricky mum too and make my secret gifts out in the open. Unfortunately my girls are on to me. Happy Birthday to your little Millie. You have beautiful children and like all mums know, they grow up way too fast. How sweet that she got that blanket by surprise. Hope all is going well with your new little guy. I'm sure he is keeping you busy and your girls are keeping you hopping. Happy Birthday to your sweet little girl! And little Tobie is growing...can it be....look at those little legs...such a cutie pie! I love all children and of course babies are fresh from heaven so what's not to love about them! How are you managing with the heat and fires there? I hope you are all okay and safe from danger. The weather in our world has certainly gotten more violent. I'm on FB so I'll go "friend" you...mind you I play a lot of the farming games there so be sure and block any game feed from me. I wish I could buy my yarn from you but I'm sure the shipping would be prohibitive although with 50% off how bad could it be? LOL! I'm so glad Millie got her blanket! What a wonderful family you have.